Born on January 17, 1706, Benjamin Franklin was one of the Founding Fathers of United States of America. He was an extremely talented person with diverse skills including being an author and printer, scientist, civic activist, diplomat and statesman. He was responsible for some extremely important inventions during his lifetime. He came up with glass 'armonica', the lighting rod and the Franklin stove. He is the reason behind the formation of the first fire department in Pennsylvania and the first public lending library in the USA. He was seen as a role model due to his hard work, self-governing institution, community spirit and education. Due to his interest in science and technology, he did many experiments and became famous and paramount because of such. He established the Marshall and Franklin College and the University of Pennsylvania. He was the most honored individual because of his education, scientific and political achievements. His father Josiah Franklin was a both a farmer and a blacksmith. Josiah Franklin actually married two wives who bore him seventeen children. When Anne Child died in the year 1677, Josiah Franklin married Abiah Folger, mother of Benjamin Franklin. In 1770s, Benjamin Franklin's father became a Puritanism convert, which was a protestant movement that purified Anglicans from features of Roman Catholic beliefs. His religion has three main objectives that were very important. First, the minister would have to give a sermon, not perform a ritual. Secondly, the religion would be self-governed and lastly, that there must be Bible studies to help people develop and strengthen their relationship with God. These were qualities not found within the Roman Catholic Principles. Josiah had a core Puritan value that personal worth is earned through hard work from the Hebrew Bible, Proverbs 22:29 "Seest thou a man diligent in his calling he shall stand before kings." Throughout his life, Benjamin Franklin preached the Puritan values of hard work and Equality. Abiah Folger, Ben's mother and Josiah's second wife, was among the first pilgrims to flee to Massachusetts for religious freedom when Protestants were being persecuted by King Charles I. Her father was jailed for disobeying the local magistrate. Benjamin Franklin was born on Milk Street, in Boston, Massachusetts on January 17, 1706 and baptized at Old South Meeting House; being the fifteenth of their seventeen children. 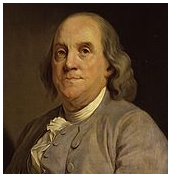 Benjamin attended Boston Latin School but did not graduate; his schooling ended when he was ten and he had to work for his father and at 12, he became an apprentice to his brother James, a printer. Franklin became a fugitive when he invented a popular pseudonym which over-run James' New England Courant, the first truly independent newspaper in the colonies. Benjamin ran away to Philadelphia, Pennsylvania at the age of 17. He first worked in several printer shops around town, but was later convinced by Pennsylvanian Governor, Sir William Keith to go London to acquire necessary equipment for establishing another newspaper in Philadelphia. In Philadelphia, he served as a delegate in the Philadelphia Convention. He is known to be the only Founding Father that is a signatory of U.S. founding documents which are, United States Constitution, Alliance Treaty with France, Paris Treaty and the Declaration of Independence of the United States.